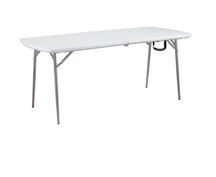 Our line of Blow-Molded HD Polyethelene Folding Tables are the only kind in the industry; built on a 17-gauge frame, for true support strength ranging from 700-1000 lbs. without table bowing. The #BT3000 Series has wishbone-style legs for strength, support and aesthetics, and has a unique molded design to withstand the rigors and demands of Institutional use. In addition to the three traditional sizes available are three rounds. 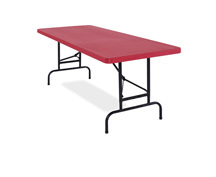 All American Colors new line of adjustable height tables and chairs utilize the same superior specifications as the #BT3000 Series in primary colors red and blue. 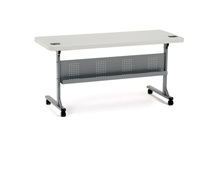 The #BT1800 Series brings Blow Molded Tables to a whole new level, by combining the strengths of plastic with the benefits of a cantilevered leg, for training and conference room applications. 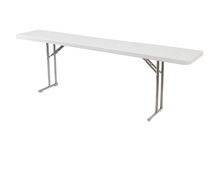 Also popular as scoring tables, they are available in three popular sizes. The #600 Series is a matching blow molded folding chair line, built to the same heavy duty standards as the tables. A full array of matching transport dollies are available. 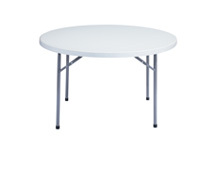 Plastic Flip-n-Store Tables; an industry first. 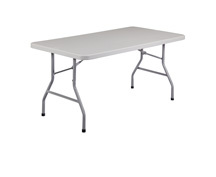 Building on a popular concept, we have introduced a Blow Molded High Density Polyethelene Table in a 24” x 60” size that flips open and closed for easy use & storage. Easy to clean and lightweight, including wire management cable channels & grommets, this bestseller is furnished in grey with a top that is as smooth to write on as laminate! New for 2016: 24”x72” size!